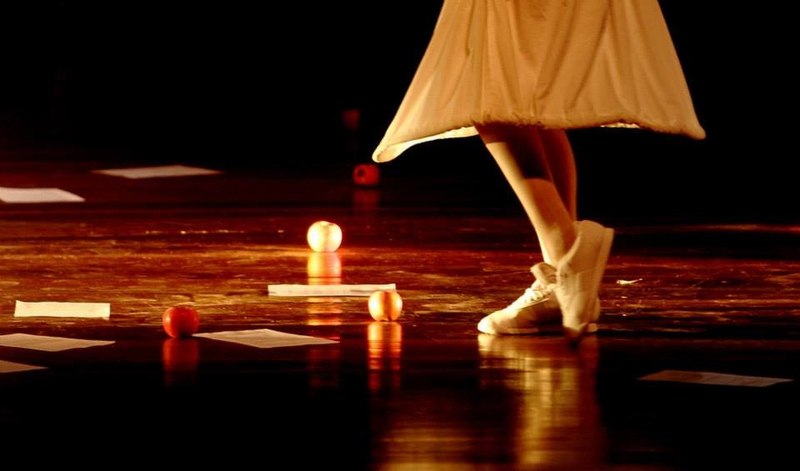 Companhia de Teatro Contemporânea’s production of German writer Robert Walser’s verse drama Schneewittchen (Snow White) stakes a bold claim to being the most pointlessly static piece of theatre I have ever seen. I’m sure it can’t be, but I’m struggling to come up with a contender. The cast of four are all stood under an apparently pointless wire frame, and attached to it with four bits of elastic/string each, running from their heads or collars up to the frame. The string isn’t taut, but not once do they even strain it. They’re all under spotlights, as are four apples: one dangling near each performer. There are a bunch of other (large, red) apples dotted about on the ground. There’s also a bloke with an electric guitar closer to the front of the stage (and not attached to the frame. Not that it matters. He doesn’t move either). There is a further problem here, in that I don’t speak a word of Portuguese and there are no surtitles, so I’m denied the chance to at least read Walser’s text, which is presumably quite good. However, even without surtitles, I can recognise vocal patterns, and the ones here are straight from the school of “nice loud voice does ‘acting narration’.” It’s the same school of speaking that people on Radio 4 adopt for reading poetry, or for over-acting badly in radio drama: *too much* voice, too much emphasis, too many sing-song, swoopy vowel sounds. Oh, and they all do “crap sinister laughter” at several points. I can’t imagine Robert Walser would be very pleased either. Obviously, I can’t say a word about the text, but no matter how brilliantly written it is, this was still a deeply, deeply inadequate staging of, well, anything, frankly. If you’d stuck it on the radio you’d at least only have had to put up with the annoying vocal style, but as a piece of theatre with pretensions to the visual it struck me as a catastrophic misunderstanding of the medium.